Looking for a growing and useful open source project to contribute to? Want your contributions to be warmly welcomed and acknowledged? Want a free project t-shirt to show you're a contributor? Welcome! You have found the right place. hug is growing quickly and needs awesome contributors like you to help the project reach its full potential. From reporting issues, writing documentation, implementing new features, fixing bugs and creating logos to providing additional usage examples - any contribution you can provide will be greatly appreciated and acknowledged. The first step when contributing to any project is getting it set up on your local machine. hug aims to make this as simple as possible. Fork the project on GitHub . If you have autoenv set-up correctly, simply press Y and then wait for the environment to be set up for you. If you don't have autoenv set-up, run source .env to set up the local environment. You will need to run this script every time you want to work on the project - though it will not cause the entire set up process to re-occur. Run test to verify your everything is set up correctly. If the tests all pass, you have successfully set up hug for local development! If not, you can ask for help diagnosing the error here . Check the issues page on GitHub to see if the task you want to complete is listed there. If it's listed there, write a comment letting others know you are working on it. If it's not listed in GitHub issues, go ahead and log a new issue. Then add a comment letting everyone know you have it under control. If you're not sure if it's something that is good for the main hug project and want immediate feedback, you can discuss it here . Create an issue branch for your local work git checkout -b issue/$ISSUE-NUMBER . Run clean to automatically sort your imports according to pep-8 guidelines. Ensure your code matches hug's latest coding standards defined here . It's important to focus to focus on making your code efficient as hug is used as a base framework for several performance critical APIs. Submit a pull request to the main project repository via GitHub. Thanks for the contribution! It will quickly get reviewed, and, once accepted, will result in your name being added to the ACKNOWLEDGEMENTS.md list :). 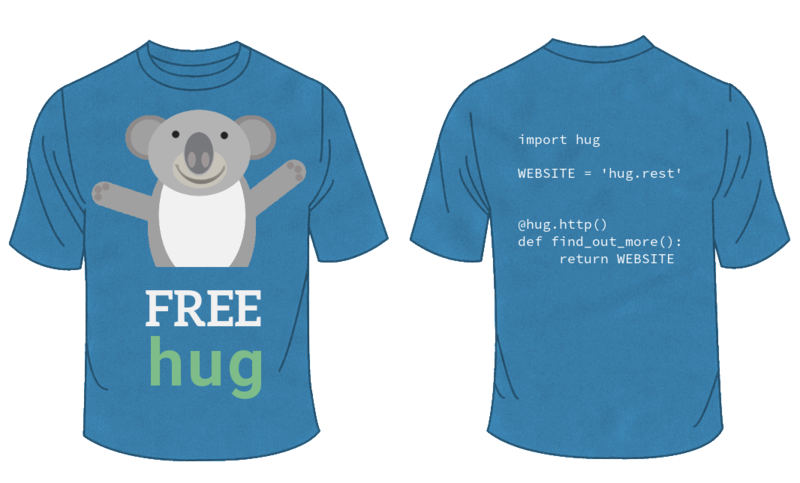 Once you have finished contributing to the project, send your mailing address and shirt size to timothy.crosley@gmail.com, with the title hug Shirt for @$GITHUB_USER_NAME. When the project has reached 100 contributors, I will be sending every one of the original hundred contributors a t-shirt to commemorate their awesome work. I can not tell you how thankful I am for the hard work done by hug contributors like you. hug could not be the exciting and useful framework it is today without your help.